Editor’s Note: We continue our reporting on news from police reports. Besides covering the many stories from around Park Forest that otherwise might go unnoticed, we want to bring more complete coverage of police reports than is reported by other local media. The police give us every report they have that is ready to file, everything recent, and are even willing to give us filed reports if we ask. Park Forest Police answer 23,000 calls a year. There’s no way we’re going to be able to report on all of them. We will always include some introductory comments before the first item. While everything that follows is a matter of public record, we do not believe it is necessary to have names on page one. Park Forest, IL–(ENEWSPF)– Police responded to a resident’s complaint of credit card fraud at the Park Forest Police Station on January 8. The resident noticed charges that had been made on a credit card without the resident’s consent. Police were called to the 400 block of Tomahawk on January 7 in reference to a residential burglary. A DVD home theater system valued at $300 and another home theater system valued at $200 were reported missing. Police were called to a business in the first block of Indianwood to investigate a deceptive practice involving fraudulent checks. No arrests were made. Police continue to investigate. Police were called to the 100 block of Ash Street on January 21 to investigate a report of an injury involving an unwanted subject in a residence. There were no arrests. Police responded to the first block of Cedar on January 22 to investigate a report of a domestic disturbance. No arrests were made. Police continue to investigate. Joseph V. Williams, 21, 420 Concord, Chicago Heights, was arrested on January 19 and charged with possession of cannabis in a parking lot in the first block of North St.
Benjamin W. Newhouser, 22, was arrested on January 19 and charged with domestic battery when police were called to the 100 block of Sycamore Dr. to investigate a domestic disturbance incident. Caesar Gonzalez, 233 E 21st, Chicago Heights, was arrested on January 22 and charged with possession of cannabis, driving a vehicle with obscured/tinted side windows, an expired registration sticker, and no valid driver’s license, during a traffic stop on Sauk Trail, east of Western Ave.
A juvenile was arrested on January 23 at a business in the 100 block of South Orchard and charged with retail theft for allegedly attempting to take four bags of cheese flavor curls. Officers were called to the 400 block of Shabbona on January 11 to investigate a residential burglary. A digital camera, digital mini camcorder, and a wallet with approximately $30 cash were reported missing. Police found a muddy shoeprint, and continue to investigate. Police were called to the 200 block of Tampa on January 11 to investigate a possible burglary. Nothing was reported missing. Police discovered muddy shoeprints in a hallway and an open window. A screen was reported damaged. Police continue to investigate. Police were called to the 400 block of Tomahawk on January 12 to investigate a suspicious subject walking in a resident’s back yard. A wallet was reported taken from a home. Police were called to the 400 block of Tomahawk on January 14 in reference to a burglary to a garage. The garage door “appeared to have been forced open by pushing on the door,” the report says. Nothing appeared to be missing. Police continue to investigate. Police were called to the 400 block of Indianwood on January 20 to investigate a report of a residential burglary. A desktop computer valued at $1,200 and printer valued at $150 were reported missing. A double glass pane patio door was broken. Police were called to the 200 block of Allegheny on January 20 to investigate a residential burglary. Brandon A. Hopkins, 18, 240 Arcadia, Park Forest, was arrested and charged with criminal trespass to residence. A juvenile was charged with criminal trespass to residence in the same incident. Items reported stolen include a three television sets, a wallet, and a watch. 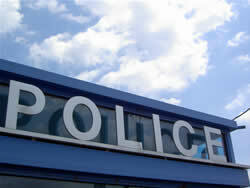 Police were called to the 100 block of Indianwood on January 20 to investigate a report of criminal damage to property. The tire of a van was reported punctured. Police were called to the 3500 block of Western Ave. on January 20 to investigate a report of an unwanted subject. No arrests were made. Walter Oliver, 32, 15 Leims, Park Forest, was arrested on January 21 and charged with domestic battery when police responded to a call in the first block of Leims. Police responded to a resident at the Park Forest Police Station on January 21who reported a stolen automobile. Police continue to investigate. Police responded to a resident at the Park Forest Police Station on January 20 who reported credit card fraud. Police continue to investigate. James T. Bray, 27, 51 A Hemlock, Park Forest, was arrested on January 21 and charged with unlawful possession of cannabis and three counts of possessing a firearm without a valid Illinois Firearms Owners Identification card. Gilbert L. Ellis, 19, 709 E. 154th St., South Holland, and Tykari P. Austin, 18, 15235 S. Dorchester, Dolton, IL, were arrested and charged with disorderly conduct on January 22 at Rich East High School after a basketball game. In the same incident, a juvenile was also charged with disorderly conduct. Police were called to a school in the 200 block of Wilson on January 22 to investigate a report of criminal defacement of property. The report says, “An unknown suspect spray painted the word ‘SLEEPY’ with red paint on the west exterior wall” of a mobile classroom. There were no arrests. Pierre E. Palmer, 18, 6 McGarity, Park Forest, and Lester L. Larkin, 18, 3412 W. 12th Pl., Chicago, were arrested on January 23 and charged with possession of cannabis when police approached them, parked in a car, in the first block of McGarity.